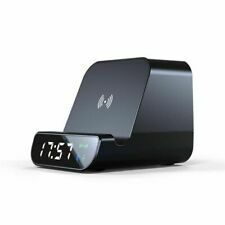 Versatile: unique wireless speakers with integrated wireless charging pad and alarm clock and power cord features. Input jack: USB, micro USB, Bluetooth. Compliant with Bluetooth standard: V4.2 EDR. IPhone X, iPhone 8/8 Plus, Galaxy Note 8, Galaxy S8, S8 Plus, Galaxy S7/S7Edge, Galaxy S6/S6 Edge/S6 Edge Plus, Google Nexus 4/Nexus 5/Nexus 6. 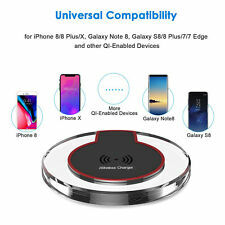 【5W, 7.5W and 10 W WIRELESS CHARGING MODELS】 5W model Using 5V,2A adapter is for Any Qi-enabled devices like iPhone X/8/8 plus Samsung Galaxy S9/S9 Plus and other Qi-enabled phones; 7.5W model Using QC2.0/QC3.0 adapter (9V,1.67A) is ONLY compatible with iPhone 8/ iPhone 8 plus/iPhone X so far. IPhone XR ,XS ,XS MAX. 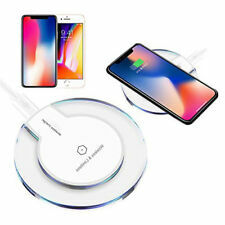 【5W, 7.5W and 10 W WIRELESS CHARGING MODELS】 5W model Using 5V,2A adapter is for Any Qi-enabled devices like iPhone X/8/8 plus Samsung Galaxy S9/S9 Plus and other Qi-enabled phones; 7.5W model Using QC2.0/QC3.0 adapter (9V,1.67A) is ONLY compatible with iPhone 8/ iPhone 8 plus/iPhone X so far. For iPhone X for iPhone 10 for iPhone 8 8 Plus for Samsung Galaxy S7, S7 Edge, Galaxy S6, S6 Edge S8 S8 PLUS NOTE 5 8. 1: Insert one end of USB charging cable into power adaptor or computer. The LED indicator lights up to indicate well connectivity. Without the interface of the charging cable. Charging efficiency: ≥75%. Charging frequency: 100-200KHz. 1 x Charging Cable. Relax, the sound quality is good, let the person relax down to go to sleep. Battery Capacity 4400mAh. Support Qi wireless charging. 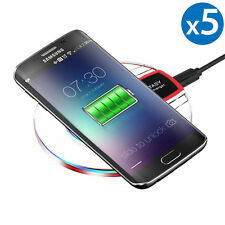 It is convenient to use, wireless charging function. Li-ion Battery capacity: 2 PCS of 2200mAh battery inseries. 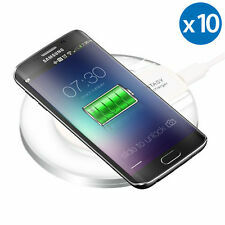 ZENS Universal Qi 10W Fast Wireless Charging Pad / Stand - Black.